Flirt Pattaya/San Miguel free prize draw!! May Venues to visit if you want to WIN WIN WIN!!!! 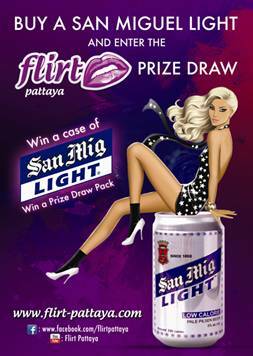 Every time you buy a San Miguel Light in any of the above venues during the month of May you will be entered into the San Miguel Light/Flirt prize draw. Each venue will have one winner and the lucky winner will receive a free case of SML and a prize draw pack.